Bunco is a fun, fast-paced game that is easy to learn. There are no "official" Bunco game rules. The World Bunco Association reports many versions of the rules. The key to having a fun Bunco session is to agree on your rules before you start playing! The number of rounds played per set - Most versions play six rounds, but some only play four. The number of sets per game - Most play three sets. The original Bunco game has been around since the Victoria era and has remained one of the most loved games. In recent years, a game board has been introduced to add a new dimension to the play. The game board has corner artwork showing a shoe, an eye, a dancing woman and a diamond ring. If a player earns a "Bunco", and if any of the die lands on the corner artwork, the player is awarded a second "Bunco". The manufacturer suggests having a Bunco board game on each table where the Bunco dice game is played. The players roll the dice and accumulate "wins" or "Buncos". The winner is the player with the most "wins" or "Buncos" at the end of play. Collect all score sheets from the tables. Draw a star on four score sheets. Have all players select a score sheet. Those who select a score sheet with a star sit at the head table. All other players select their seat at the other tables. The players sitting across from each other are teammates. Pick one player at each table to be scorekeeper. 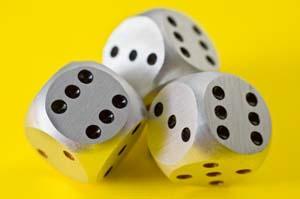 Bunco is a great game for a group of people to play when they are bored. It is a wonderful way for family members to spend a Thanksgiving afternoon if they are not football fans.You need to have four players at each table. You can increase or decrease the number of tables to meet the total number of players available. If you play with more than twelve players or if you are having a Bunco tournament, just add the number of tables needed. You can play with an odd number of players if you use a "ghost". The partner of the ghost rolls the dice and keeps score for the ghost. The play starts when the scorekeeper at the head table rings the bell. The players at each table take turns rolling the three dice at their table and marking their score on their score sheets. During the first round, the players are trying to roll a "1". If a player rolls a "1", the player can roll the dice in round two. The player continues to roll the dice until a roll earns no points. The play then moves to the player on the left. The player records their score on their score sheet. The players continue to roll until a team at the head table scores 21 points or more and yells "Game". The scorekeeper at the head table rings the bell to signify the end of the round. Players can continue to roll to finish the turns that had started before the scorekeeper rang the bell. Wins a round at their table - They record a "W" for the round. The other team would record an "L" for their loss of the round. Wins a "Bunco" - They make a hash mark on the score card. The scorekeeper for the table tallies the points for the two teams for the round. The scorekeeper for the table rolls first in the next round after the bell is rung by the scorekeeper at the head table. Many Bunco players consider four rounds to a set, with others play six rounds. Players can receive points in several ways by rolling the three die. Round 1 - Points are scored for every "1" that is rolled. For example, a roll of 1-1-4 would be scored as two points since the "1" was rolled two times. Round 2 - Points are scored for every "2" that is rolled. Round 3 - Points are scored for every "3" that is rolled. Round 4 - Points are scored for every "4" that is rolled. Round 5 - Points are scored for every "5" that is rolled. Round 6 - Points are scored for every "6" that is rolled. Five points if the number rolled does not match the number of the round. For example, rolling 4-4-4 in round 3 would earn 5 points. Twenty-one points (called a "Bunco") if the number rolled matches the number of the round. For example, rolling 4-4-4 in round 4 would earn 21 points. The player has to yell "Bunco" to get the points. The winning team at the head table does not change seats. The other team at the head table changes seats with the winning team at table #2.The losing team from table #2 changes seats with the winning team from table #3. The losing team from table #3 does not change seats. After all players have changed seats, they should change partners. The winner is the player with the most wins or "Buncos" during the set. Amazon - The basic Bunco game. Bunco - The board can be purchased separately.